Since we moved, our electricity bill has varied considerably. Our cheapest month was December when we only used 464kWh, compared to our most expensive month, July, when we used 990kWh. January was another high usage month, at 803kWh. So, naturally, I began trying to figure out why December was so much less than January. The answer is simple: we were away. During December, we were visiting Pennsylvania for a total of 10 days. Incidently, we were gone for a week in November, as well, and our November usage was only 600kWh. Whenever we travel, I unplug various items around the house including the TV, microwave, computers, etc. These items sit, unplugged the whole time we're gone, using zero electricity. So let's do the math. If we're gone for one week, that's 168 hours that these devices are unplugged. Considering just how much electricity is sucked up by electronics (even when they're off), you can see how keeping them off for just one week saves a considerable amount of money. But I obviously don't want to unplug everything in the house for one week out of every month. The other day, I was sitting at my desk checking some emails when I heard a click behind me. I turned around to see that the light timer on the fish tank and switched off for the night. 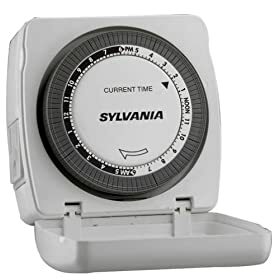 I did some quick research and discovered that three-prong, heavy duty timers are not only available, but very cheap. So, here's some more math: If I have the microwave, TV and computers turn off from 1am through 7am, that's 6 hours per night, or 180 per month. There's your week's worth of use! Some items have to stay on, like the computer for recording TV shows, cable modem, and wireless router. Those three get their own powerstrip that stays on. A second power strip gets plugged into the timer and powers the TV, stereo, DVD player, Xbox and Wii. They all get turned off at night. I often leave long downloads running overnight, so I don't want the computer itself being turned off at night. So the computer and external hard drive go on the first power strip to stay on. The second power strip goes into the timer and supplies the printer, speakers, second monitor, and two small chargers. They get turned off at night. All by itself, the microwave simply gets turned off during the night. Our next electricity bill cycle begins in just a few days, so March will be our first test month with the new timers. I'm very curious to see what kind of savings we achieve...but my guess is that we'll recoup the cost of the timers within the first month or two. I will report back at the end of March on how it worked out. Stay tuned!